He doesn’t remember anything before waking up in a bus full of kids on a field trip. Apparently he has a girlfriend named Piper, and a best friend named Leo. They’re all students at a boarding school for “bad kids.” What did Jason do to end up here? And where is here, exactly? Earlier this year I started a re-readathon of the Percy Jackson series by Rick Riordan to prepare myself to FINALLY start the Heroes of Olympus series. I've wanted to read the Heroes series for a while now, but it's been so long since I read the Percy Jackson books, that I needed to refresh my mind before starting the new series. I'm So glad that I finally had a chance to read The Lost Hero! It's a great beginning to what I know will be another awesome series. I love the mix of characters in the story, as some were completely new to me, and some were super familiar as those that we know from the previous series. I actually really love when an old friend we know from a previous book makes an appearance in a new book. (Though one character I was looking forward to 'seeing' again the most was unfortunately absent from this novel, but I hear we will 'see' him again soon!) The new group of characters were all interesting, and I really enjoyed reading all of their stories, especially the three main characters; Jason, Piper, and Leo. I'm looking forward to following these characters throughout this series! 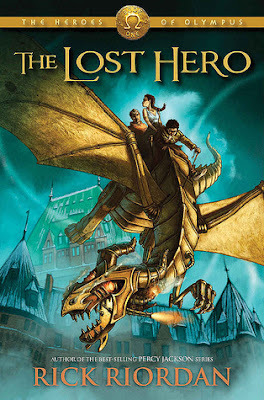 Overall; The Lost Hero is a great start to the Heroes of Olympus series, and I'm already hooked! I'm so glad all of the books in this series have already been published, so I can read straight through the books without having to wait for the next to be released. I'm starting the next book in the series, The Son of Neptune, as soon as possible! If you love the Percy Jackson books and haven't yet checked out this series, you should totally do so!